I love rainy days. Love them. Every time I have to leave my house on a rainy day, and forego listening to the sound it makes, I feel it was a day wasted. Now my dark and gloomy soul can have a thunderstorm (sans rain) whenever I want with the Smart Cloud. This unique light fixture promises to mimic the experience of being in a thunderstorm, cloud lighting and thunder included. Don’t worry, there’s no sprinkler system attached, so it’s just the light show and sound effects. The Cloud itself is made from hypoallergenic fiberfill and a sponge casing. Inside of that rests the tech guts that control the light and sound effects. 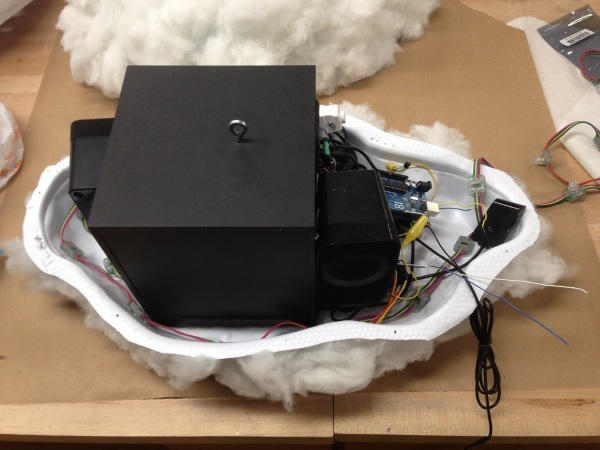 It’s a fully interactive piece that produces a unique experience based on the user’s movements, although you can also control it with the included remote. But that’s not all, you can synch up to any Bluetooth device to stream music through the speaker system. With the color changing lights and a music reactive mode you can turn your living room into a dry rainy rave. Your home made dance party would be heavenly. 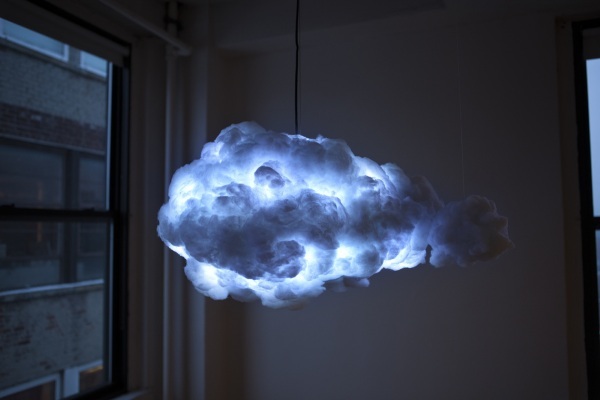 As dreamy as the Smart Cloud is, the price of $3,360 means I for one will be waiting for the next rolling thunder storm. But a girl can dream.